The recent cold weather has caused a lot of pipes to burst and these problems only became apparent once the thaw set in. Not only have the mains water supplies been affected by reductions in pressure from leaks, but a lot of buildings owners discovered leaks inside their properties. 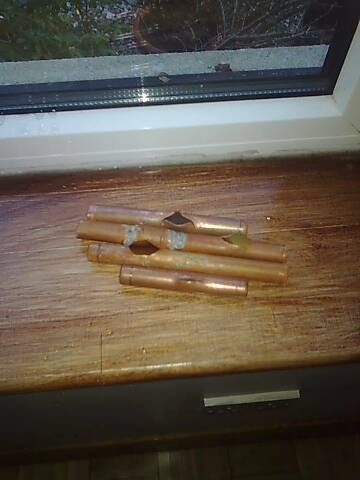 During the Christmas break I helped to fix some copper piping which was leaking. It was the first time I have done this, my Father in law showed me how; it was a straight forward task and is something most people could attempt. I have listed how to carry out the repair below in case it may be of use to someone. The particular house was unoccupied during the cold weather with the water turned off. But when the water was turned on again after the thaw, there were four leaks from burst pipes. The burst pipes was the copper water piping for the central heating. See photographs below. Cutting the pipe either side of the leak with a pipe cutter, this cutter also shaped the end of the pipe ready for the new connection. Cutting a new section of copper pipe from a long piece bought in the local hardware shop. Fitting the valve connector to link the new sections together. 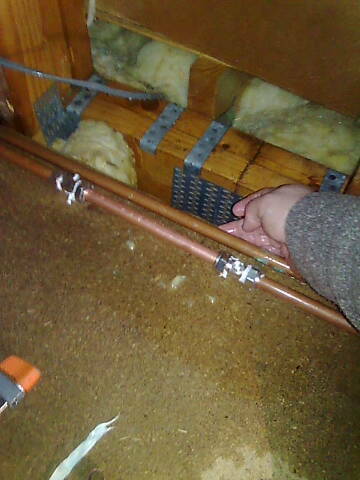 We used white tape on the threads to help water tightness. Only valve connectors were available as the standard (non-valve) connectors were sold out. We turned the water on again and checked the connection for leaks. 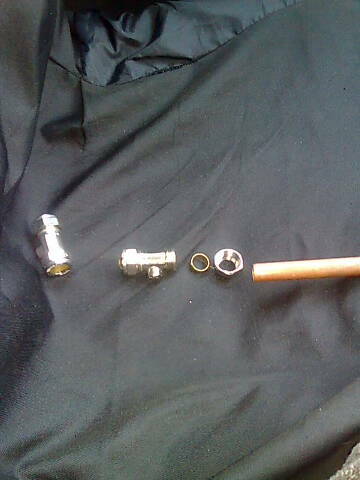 Tools required: Copper pipe of same diameter as damaged section, pipe cutter/ shaper, two spanners, white plastic sealing tape to wrap valve threads, new connection valves. There is no point in sealing the threads as you have shown. The seal is made between the brass olive and the pipe and the chamfered ends of the compression fitting. The best method is to tighten the joint without any sealer or tape until the olive slightly compresses the copper pipe. Then open the fitting again and check that there is a slight dent inside the pipe with your finger. 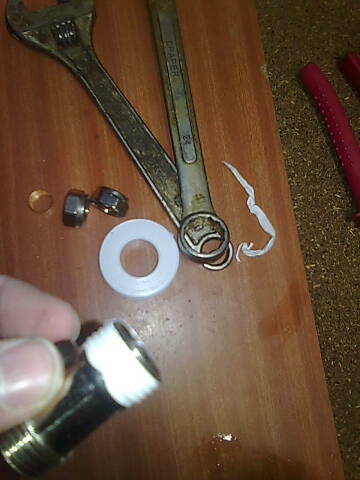 Then rub a small smear of boss white on the olive and re-tighten the fitting. The seal is made between the brass olive and the pipe and the chamfered ends of the compression fitting. The best method is to tighten the joint without any sealer or tape until the olive slightly compresses the copper pipe. Then open the fitting again and check that there is a slight dent inside the pipe with your finger. Then rub a small smear of boss white on the olive and retighten the fitting. Thanks for that Brian, will keep it in mind. I have added your comments to the article. The weather during the winter and autumn months has become drastically more adverse and the problem is that it is hard to prepare for. The destruction caused by water damage for example, can occur so quickly. Some really great advice in this article. I think it is important to regularly check all pipes and drains. As you mentioned in the scenario above, this problem only became apparent when the pipes began to thaw.